I started the 100 pushups challenge this week. It’s a neat exercise program that only takes about 30 minutes per week and promises to have you doing 100 pushups in six weeks. Having done the first two sessions, I think six weeks is too optimistic. Eight to ten weeks is more like it. They have a log site where you can enter all the workouts. If for some strange reason, you want to check out my log – click here and search for “mikeholman”. If anyone wants to try it, let me know so I can check out your log results. The Finance Buff figured out that the oft-quoted Dalbar numbers which show that investors underperform their investments – are wrong. I never believed the Dalbar numbers and found this article very interesting. Dianne Nice of the Globe & Mail warns that credit card fraud is growing more inventive. Make sure you check your statements. Financial Uproar is thinking about buying Tokyo Electric stock. 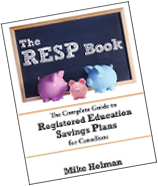 Andrew Hallam thinks a mandatory RRSP savings program for Canadians is a good idea. Read the comments to find out my opinion. Retire Happy blog says Canadians don’t know much about taxes. Some good comments. Canadian Capitalist notes that Canadians pay a lot for their mutual funds. Boomer and Echo share his experience with tax filing with TurboTax online. Ellen Roseman says watch out for missing tax slips. I missed an RRSP contribution receipt last year, which cost me. Kevin from Today’s Economy says that working for free has it’s benefits. Oblivious Investor says that it’s easy to upgrade to a higher model when replacing electronics. Kerry from Squawkfox advises not to work for free. Million Dollar Journey reveals that his old rental house was bought in foreclosure. Mike, you need to post a video when you do 100 pushups! I should start trying this out. First you give up beer and now you’re doing push-ups? What gives? The sad part is that once you complete the challenge, your prize is that you get to do 100 push-ups…….yay! Thanks for including me and your comments on the allowance articles this week! When I was single, my roommates and I did push up competitions to see who would do the dishes for the week. I we all got to over 100 push ups in a short period of time. Thank goodness those days are long gone! @Echo – The no-beer thing is over. Good point about the lack of a prize. @Jim – That sounds like some pretty good motivation. Thanks for the mention Mike! I’m not sure I agree 100% with the Finance Buff. We could quibble over how much gap there really is but so many studies have confirmed the existence of one. And I see it all the time among people I know. And I myself struggle very hard not to give in to timing temptation and invest money when I have it. Thanks for the mention. Good luck with the push-ups! Over the last 5 yrs, I’ve bought a treadmill, a weight set, an exercise bike and even one of those flippy-rowy things. Some of these are in my bedroom. Now when I wake up in the morning, I avoid eye contact at all cost. I feel like the machines are starring back at me! I must be losing my mind! Let me know if you are still doing push-ups in June, Mike! 100 push ups all at once Mike or in sets? Cuz’ I’ve boxed semi-competitively for awhile now and I can tell you with a pretty high degree of confidence that it would take the vast majority of people a lot longer than 8-10 weeks to build up to doing 100 real push ups in a row! Why do you think you’ll need 8 or 10 weeks to get to 100 push ups, Mike? Six weeks should be easy! I mean, really. If you do 17 push ups a week, you’ll have 102 of them under your belt by the end of week six. Stick with me buddy. I’ll have you in shape in no time. Love Len’s comment, I’ll have to remember that one. Give us an update in a couple months Mike, I’m interested to see if your net worth will grow faster than your pushup count! @Uni Money Ha – it would be nice if my net worth could increase that much.